An easy breezy adventure awaits at Aloft San Antonio Airport. A free shuttle whisks you from San Antonio International Airport to our loft-inspired scene. We're steps from top shopping and 15 minutes from the Alamo Citys scenic sights and family fun! Meet & mingle with friends at our w xyz(SM) bar, grab a sweet, savory, or healthy snack from re:fuel by Aloft(SM), our 24/7 pantry, or play in our re:mix(SM) lounge. Plus, you can always stay connected with complimentary hotel-wide wired and wireless Internet access! Breeze into one of our Aloft rooms, featuring our ultra-comfortable signature bed, an oversized showerhead, custom amenities by Bliss Spa, and more. Our plug & play connectivity station charges all your electronics and links to the 42 LCD TV to maximize work and play. Passing through the Alamo City on a business trip or carefree vacation? 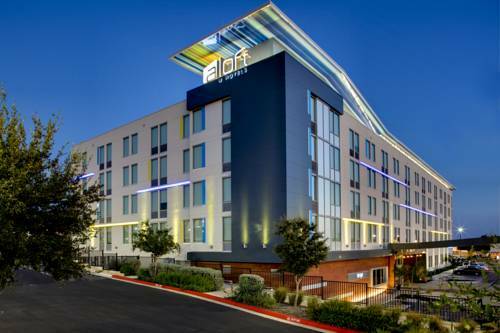 Aloft San Antonio Airport is just 10 minutes from baggage claim at San Antonio International Airport but light-years from all those other run-of-the-mill airport hotels. Abuzz with the energy of discovery and interaction, this bold new airport lodging alternative might just inspire you to stick around and explore our namesake city an easy 15 minutes away. Stay and play awhile! Youll discover an airport hotel with a lively suburban setting just steps from serious shopping plus a short drive to the citys most historic sites. Stroll out our door to explore the stores of the new Park North Plaza. Or zip a mile down the road to the upscale North Star Mall. We offer a quick connection to the airport and easy access to loads of area offices. Family fun at Six Flags and SeaWorld are conveniently close, or dash into downtown to discover the Alamo, River Walk, and much more! Need local tips? Check out Aloft San Antonio's in-touch terminals in our re:mix(SM) lounge, for easy breezy Internet access to all that need-to-know info. Then ease on down the road and experience the Lone Star States most historic corner.